This is a review of What’s a Person to Do? 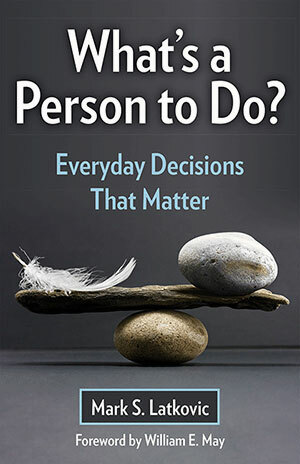 : Everyday Decisions That Matter by Mark S. Latkovic (OSV, 2013). Instead of talking about the big hot button moral issues like abortion, transgender rights, the death penalty or gay marriage, Dr Latkovic has decided to write a book with 40 questions on moral issues that a good Catholic might face every day. Some examples include laughing at a dirty joke, deciding on teenage children’s cell phone use, tattooing, working “under the table,” and speeding. I think this book is important because our goal as Christians is not simply to avoid big horrendous sins, but to grow in virtue until we imitate Christ fully. He calls this a “faith ethic” which is directed towards “Attaining true human happiness, not just observing what some see as a collection of your rules, of do’s and don’ts.” (23) Very few of the issues he talks about our politicized so he can discuss morality without appearing to take sides – this leaves him much more freedom to really investigate the questions rather than just argue his side’s point of view. Mark is good at making distinctions. For example, when asking how much of houses flaws when needs reveal when selling, he points “Distinctions between lying, deception, withholding information, and concealing information.” (42) The last two may not be wrong. Thus he suggested a homeowner is obliged never to lie or deceive – thus asking them to reveal major flaws – but leaves some onus on the buyer for investing the house – so the seller need not mention every little detail like the toilet leaks. Then he lists the legal obligations from a real estate website. I took one small point with one paragraph in the book where he said we should never buy things from stores like Victoria’s Secret. I would agree that we should avoid as much as possible but a woman once asked me about a concrete situation where it was legitimate: she said that she would have sore shoulders if doing a certain activity except with a bra from VS – and even though she was disgusted with other aspects of the company, she felt no way to get around without a severe discomfort. I told her it was fine before reading the book and when I messaged Dr. Latkovic with this exception he seemed to agree. Overall, I would recommend this book although many readers may want to just pick out a dozen of his forty questions to read write and read it cover to cover. Disclaimer: Dr Latkovic was a professor of mine at a summer class on another topic last summer and gave everyone in the class this book for free.